Alright, I did it. 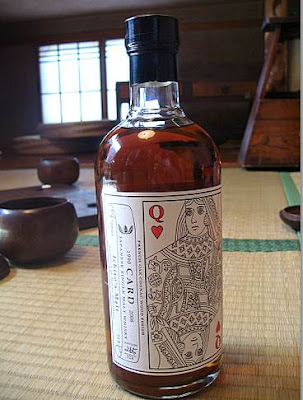 I opened the Ichiro`s Malt Queen of Hearts. She had been sitting there on the shelf wiggling her tush at me for months and finally I cracked. The colour was distinctive: tea that has been left steeping for hours. Smelled of varnish, apple, wet hair in a hairdresser's. I often like my whisky neat, even alcoholic bully boys like the 4 star Ichiro's Malt Single Cask 2000. This one, however, benefited from a touch of water. It burned my mouth without it (sulphurousness obscuring sweetness). With just a dribble of water, it became a very classy, kicked back and relaxed sort of drink: quite oily and chewy with butterscotch, syrup and a unobtrusive liquorice at the end. Dr Whisky has given me permission to cross post his review on this site. Visit his great whisky blog. It is well worth the journey. Nose: "Alive and energetic. Salt. Licorice. Spicy. Lime and cheesecake. Wood, plaster, a building site. Some smoke that becomes more evident with water. As does an apple cider smell with more candied licorice, Bassetts Allsorts." Palate: "Soft, but active in all parts of the mouth, exciting. Plaster again, but a lot of oak and sweet pie-like flavours. Pecan pie. Black wine gums, white wine, dry oakiness that rides onto the finish with fresh fennel and some more spiciness. With water it tastes just like a warm pecan pie with cream. Cafe au lait. Pleasant shisha smoke aroma." Finish: "[M]ore apricot and soft old peach now. Empty glass minutes later has gorgeous filter coffee and brown sugar scents." Summary: "Exciting, adventurous whisky. Busy and a whole lot of fun to drink and talk about. Great packaging/theme labeling." Martine Nouet, Whisky Magazine, 56，1/6/2006. 7.75/10. She said it was a "well balanced and refreshing dram". It tasted "sweet and spicy" with hints of cooked bananas and lime syllabub in a "complex spicy display". Dave Broom, Whisky Magazine, 56，1/6/2006. 7.75/10. Broom found it drier and lighter than the tangy nose suggested: "An interesting battle between deep sweetness in the mid palate and fizzing spiciness". I look forward to trying it! Nice pic by the way. I just love how Hanyu always rule with their labeling. Their going their own way!